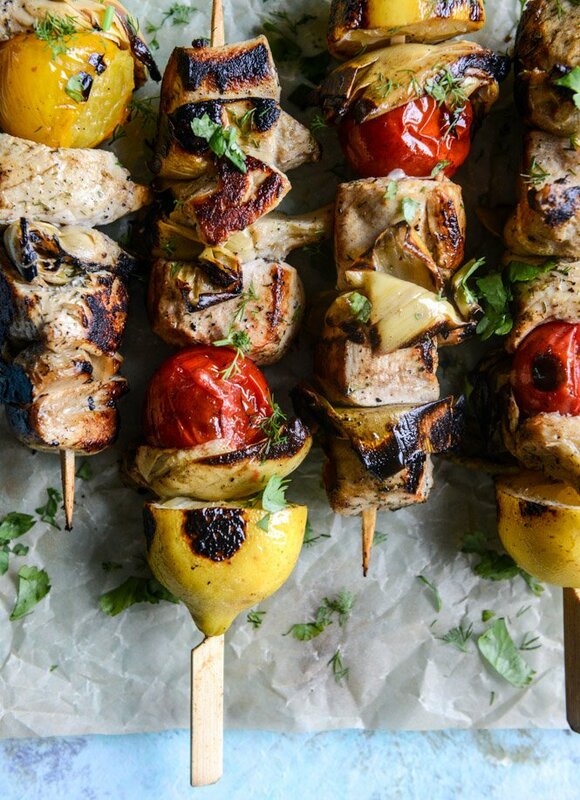 I’m bringing these chicken skewers to your house for dinner with copious amounts of goat cheese dip and tons of ice cold pinot grigio. Maybe some garlic butter bread that’s super golden and toasty because when you eat chicken and vegetables on a stick, there is, like, a ton of room for carbs. All that protein and veg asks for a big carby hug. Also, it’s wonderful, because we can use that toast to soak up any extra delicious grilled marinade. 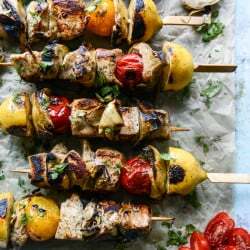 I’m a huge fan of skewered chicken and veggies – it’s just a fun way to switch up the everyday chicken dish. Right? I mean, it can be flavored exactly the same way as the chicken we had the night before, but the fact that it’s cut into chunks and skewered on a stick with some vegetables and fruit, it’s COMPLETELY DIFFERENT. This is how my brain works. Welcome to my life. So first, marinated chicken. Super flavorful and tender, kind of caramely once grilled. The char! It’s necessary. Second, these grilled artichokes. I can’t stop buying them and we can’t stop eating them and there is absolutely no limit to what I will use them for. Beware. Third, bursting, popping cherry tomatoes! The season is coming. Just don’t burn your tongue off. Finally, charred, steamy lemon to give everything more flavor. 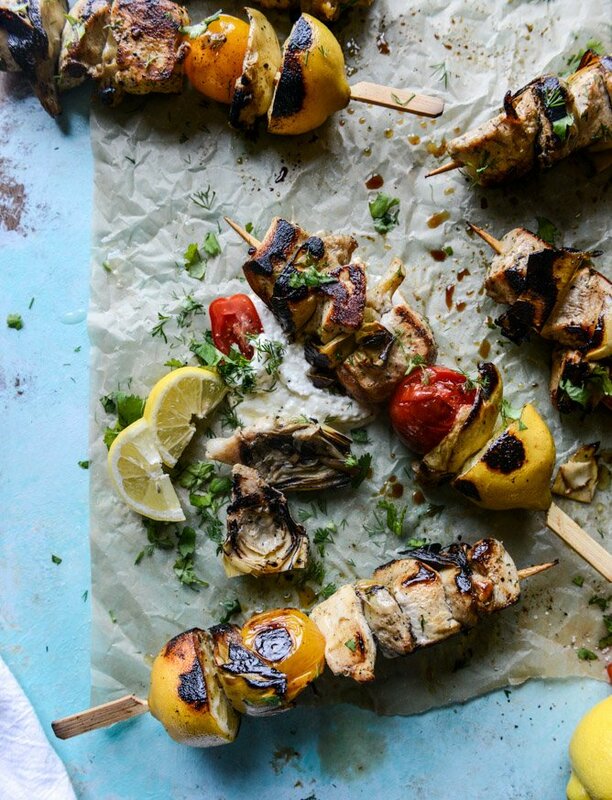 The chicken skewers are great, yes, but let’s talk about why we are all here. And I don’t know which I love more: the chicken covered in the goat cheese dip or the grilled artichokes dragged through the goat cheese dip. Both together is a major flavor punch to the face. The whole combination is savory and refreshing and light but hearty enough for a filling meal. Season the chicken with the salt and paper and place it in a resealable bag or baking dish. Whisk together the olive oil, vinegar, honey, mustard, dill and garlic and pour it over the chicken. Marinate from anywhere to 30 minutes to 2 hours or even overnight. When ready to grill, skewer the chicken (I made 6 skewers) with a lemon half on the bottom and tomatoes and artichoke hearts in between. You can skewer them however you’d like! Place the skewers on the grill and grill for about 2 to 3 minutes per side, until the chicken juices run clear and the chicken and veggies are charred. Cover the chicken with a few sprinkles of fresh chopped dill and cilantro. Serve immediately with the goat cheese dip. Place the goat cheese, yogurt, herbs, salt and garlic powder in a food processor. Blend until combined, then with the processor still running, drizzle in the olive oil. You may need to scrape down the sides a few times to make sure everything is thoroughly mixed. Taste and season additionally if needed. This will stay fresh sealed in an air-tight container in the fridge for a few days. Exciting News! – The Food Entrepreneur Summit. Is that 1/3 tablespoon olive oil 1/3 cup? Or is that just a fancy way of saying 1 teaspoon? Thanks! Should the amount of olive oil read 3 tablespoons instead of 1/3 tablespoons? This was really good but holy heck, skip the salt in the dip! This is the best thing I’ve made in a while – so dead simple and so friggin delicious!! The dip is out of this world. I sliced some zucchini and squash and brushed with olive oil, salt and pepper and grilled those alongside skewers for some extra veggies. So dang good! Can’t wait to make it again. This was delicious! My husband and I loved the goat cheese dip! This was also my first time grilling chicken and it tasted amazing! I like how this recipe is pretty simple overall but looks really fancy when it’s all done. Totally scrumptious! I used zucchini and squash instead of the chicken cause I’m vegetarian, it worked out wonderfully in my opinion. Thanks for sharing!